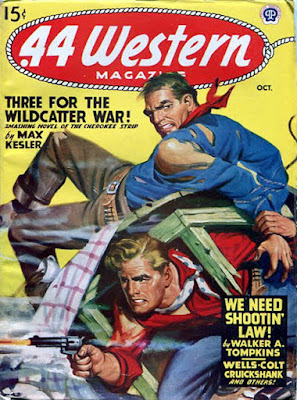 .44 WESTERN MAGAZINE was another solidly dependable Western pulp from Popular Publications, and this issue has a nice action-packed cover. The lead novella is by Max Kesler. I don't know anything about him, but I've seen several oil field stories by him and this appears to be another one, judging by its title. Other authors in this issue are Walker A. Tompkins (one of my favorite Western writers), Will C. Brown (actually C.S. Boyles, Jr., the other writer from Cross Plains, Texas, who was a few years older than Robert E. Howard), Lee E. Wells, Harold F. Cruickshank, and Harrison Colt, a name that's always struck me as a pseudonym or house-name, but I don't have any confirmation of that. This looks like a pretty good issue. You're right, it's a nice action cover, but I can't figure out what the heck is going on!